In the not-too-distant future, the sport of boxing swaps robots in for humans. And a young boy’s junkyard find sees an unlikely rise to stardom, as he reconnects with the father he never had. 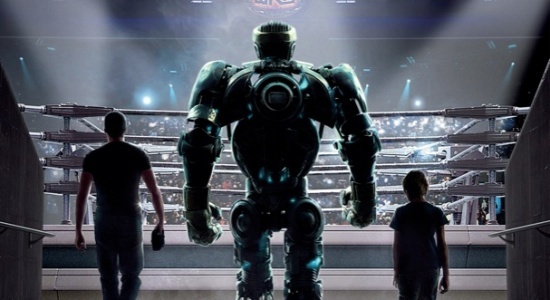 We admit, the setup for “Real Steel” seemed cliche, and the trailers suggested a potential bomb. But while our expectations were low, this family-friendly movie easily exceeded them, and gave us something we might even watch again. “Real Steel” stars Hugh Jackman, Dakota Goyo, and “LOST” alums Evangeline Lilly and Kevin Durand. It also stars a dazzling array of animatronic and computer-generated robots. We didn’t even get to talk about the score by Danny Elfman, which seemed to draw from a million other “sport champ” themes but still do something interesting. Did you see “Real Steel”? Did we capture why the flick is so charming? Or have our tastes been corrupted by the unavoidable chemical changes that come with parenthood? This entry was posted by Ryan on October 23, 2011 at 10:31 am, and is filed under Movies, Podcasts. Follow any responses to this post through RSS 2.0. You can skip to the end and leave a response. Pinging is currently not allowed.